Tonight we had Jackson's "family" birthday party at GoGo and Granddaddy's house. Everything turned out so cute! The "theme" was red, yellow, green, and blue polka dots. 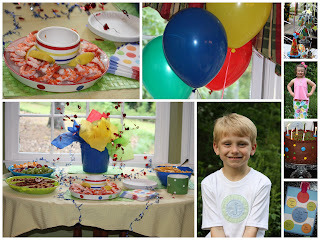 I LOVE me a birthday party and I LOVE to have a theme and go with it! My "inspiration piece" was his invitation that I found first (pictured on lower right corner). We (my mom and I) then went to adding the rest of the things to go with the theme. My new favorite find is a line called Block Party which make the cutest stuff and I found the stuff at Chelsea Lane. The chip and dip that the shrimp is in I am obsessed with... it is a chip and dip and then you flip it over and it is a cake plate...how cool is that love it so cute! I also bought a dip holder as well (lime and white polka dot in the picture) it is two parts the large part you put ice in it and then the bowl you put the dip in and it keeps it cold. How cool! So fun! It also came with a super cute polka dot spreader. I just love all this stuff and think we could us it a lot. My party hat balloon weights worked great with the balloons. My friend Ashleigh made the cake to match and it was absolutely de-lish as always! Jackson and Brylee also "dressed" for the theme as well... Jackson in his double disc shirt (best i could do for a polka dot for a boy) although I really wanted the b'day boy shirt from "Smitten & Co" i forgot to order it in time... so this had to work. Brylee also sporting her polka dots as well. We had a great time... granddaddy cooked some yummy hotdogs and hamburgers and we had lots of chips and dip, baked beans and appitizers. My mom and i had a great time decorating and creating the theme obviously Jackson is a "typical male" and could have cared less but we had fun! jackson racked up in the gift dept as well. 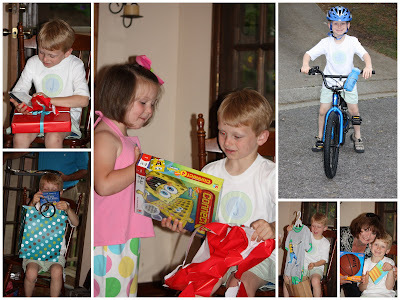 He got a new bike from GoGo and Granddaddy, Basketball and Basketball goal from Nonnie and Poppie, PJ's and a Savings Bond from Nannie and Mr. Mark, a movie and $10 from Mrs. Cathy and Mr. Randy, bike helment from KK and Star Wars DS game from us, and a game from Brylee. He was so excited about all his presents. Thank you so much sweet family and friends for helping us celebrate Jackson's birthday. We love you very much! Happy Birthday Buddy! We love you so much! Cute party! Happy Birthday Jackson!